How does Ooma's home security system work? 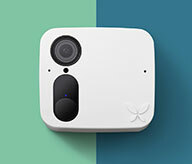 Ooma Smart Security is a complete wireless home security system that includes a variety of sensors and our state-of-the-art security camera, the Ooma Smart Cam. 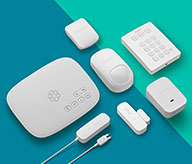 After you download and install the Ooma Smart Security mobile app to your iOS (Apple) or Android device and pair one or more of the wireless sensors/cameras, you can install the products throughout your home and get peace of mind knowing that you will receive alerts whenever unexpected activity occurs. Real-time alerts: Get real-time alerts via text, email or phone call whenever your kids get home, or whenever an unexpected face is recognized by your home security camera. Mobile-friendly: Can't remember if you left the garage door open? Our mobile app can give you a real-time look at every sensor's activity. Remote 911: If you are away from home and an emergency occurs, you can dial 911 to local dispatchers and your home address will be automatically transmitted. Personalized protection: Every home is different. That's why we let you pick which sensors and cameras you need so that you can make the right security choices for your home and your family. Wireless, stress-free setup: All of the sensors and cameras in the Ooma Smart Security line of products are 100% wireless, and can be placed anywhere - indoors or outdoors. 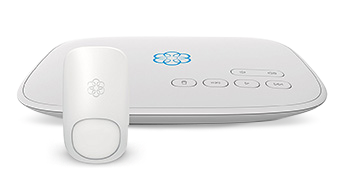 How do Ooma home security sensors connect to my Ooma Telo? How do you set up Ooma's home security system?